Be careful Hugh, it’s a trap. You’re sitting there casually watching the chick flick of her choice. It’s not a bad movie, you’re enjoying its whimsical humor. About two-thirds through the movie, just as you’ve actually become emotionally invested in the characters, she suddenly turns to you and pops this landmine under your feet: do you think Julia Roberts is pretty than me? Her: Do you think Julia Roberts is prettier than me? Her: It’s a simple question. Do you think she’s prettier than me or not? You: Of course not, you’re much prettier. Her: Why are you being a liar? Her: If you think she’s pretty you can say so. You: Okay. I think Julia Roberts is attractive. Her: If you don’t know the difference between the two words, how can properly use either one? You: I guess I would say she’s very attractive. Her: Oh, so now she’s very attractive. Is she gorgeous? You: I guess to some guys. Her: What kind of guys? You: Guys who…have the ability of sight. Her: I guess you wish I looked like Julia Roberts. You: No. I don’t need a girl who’s gorgeous, you’re fine. Her: Do you want to know what I wish? You: I sincerely doubt it. Her: I wish you looked like Hugh Grant. You: I wish I looked like Hugh Grant. You: Sure. Then I could find a girlfriend that looks like Julia Roberts. Her: Maybe I should just make an appointment with a plastic surgeon tomorrow, and get all my horrible flaws fixed. You: Don’t bother, the plastic surgeon can’t fix bitchy. And that’s why you’re still single. Note: How did the movie end? I’ll bet Hugh got the girl didn’t he? Bend over, buddy, I need a big target. Julia Roberts is one of the most “plain-Jane” average-looking actresses I’ve ever seen. I think Plain Jane was one of her earlier movies. Holarious just gigggled all the way through! I often laugh at the misery of others myself. What do you think about my Blog Buddy? Very nice. But there’s almost no laughing at the misery of others. I wonder if Julia Roberts asks her husband if he thinks Scarlet Johanson looks prettier than her. I wonder if her husband says yes. You can have Pauly Shore, take him or leave him. That’s the first time anyone had ever referred to anything in this blog as lovely. Well I was perusing some of your other posts too… It’s all lovely stuff! We only just met Sir……. let me read another four or five posts and I’ll be head over heels. To be fair, I also wish I looked like Hugh Grant. He does have that boyish charm. Usually when I get into fights with my guy about looks it’s because I’m just TOO pretty, you know? It’s always like, “GAHH why don’t you understand how HARD life is being THIS attractive.” And then I go stare at myself for like three hours in the mirror or until I pass out, whichever comes first. Sidenote: An angel cries every time someone starts Notting Hill and doesn’t see the ending. It must be hard being that attractive, I can’t imagine what it’s like. 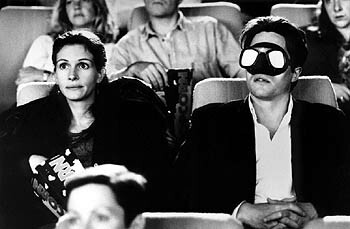 And I have seen the end of Notting Hill, very heartwarming. Your blog is so funny. 😉 Happy Valentine’s Day! Thank you. 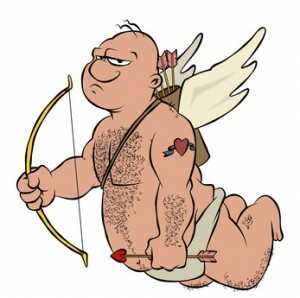 I think a happy Valentine’s Day is a given. LOL! That is sad but true. My husband would say something really awful like, “no she’s not attractive. I’m only attracted to ugly women.” Like an idiot I’d feel better for a moment and then I’d realize…Hey! I’m sure Julia Roberts can’t hold a candle to you. I think the guy in your scenario handled it perfectly. Don’t ask a question that you really don’t want the answer to. Only if there are no scars once the wounds heal. You know they say, time wounds all heels. That’s an unwinnable situation. Even for someone as suave as Hugh Grant. It’s a good thing to not be crazy. Ah, the landmine happens to me as a married man too many times. You’d think I’d have learned by now but I haven’t. However, I do tend to keep my thoughts to myself a lot more than I use to. For my own safety, of course. I can’t wait for your next blog post about when she says “oh, I don’t want anything for my birthday” and what it really means. Next blog post? Birthday? I don’t know what you’re talking about. Code Red! Get a six-pack of beer into this man, stat! OMG, I can’t even bear to look… oh,wait, that’s because I’m doubled over laughing. Six-pack? More like a case of beer and a bottle of vodka. It’s always fun to enjoy the suffering of others.